The rumours are true! Koji Harmon of Cometdebris brings back one of our all-time favourite shark-themed sofubi the notorious “Samtan”. From what we gather they GLOW IN THE DARK too! Cometdebris in collaboration with PangeaSeed to raise awareness “We give the oceans a voice”. 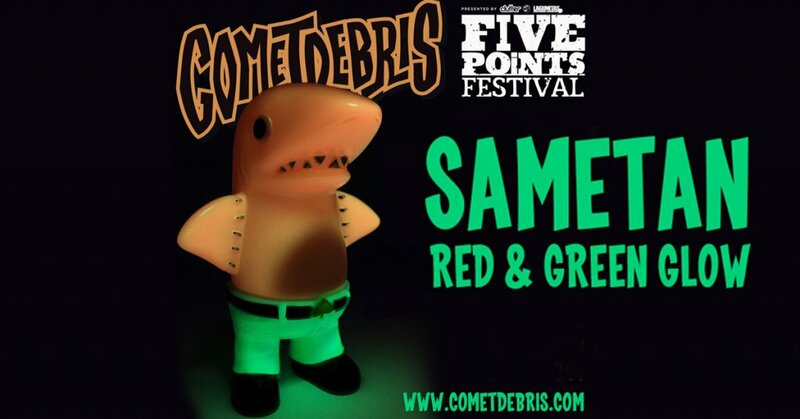 Samtan GID will make their debut at Five Points Festival along with more Cometdebris sofubi all the way from Japan which includes Oni Kid and MORE exclusives and customs which you can check HERE. Today Cometdebris has given us the privilege of showing you the finished version of SAMTAN GID RED & GREEN along with the release info. MORE reveals for Five Points Festival in up until 2nd June! Stay tuned.